IDC Retail Insights defines omni-channel merchandise optimization as the set of technologies, data assets, skills, processes, and management intent required to develop and maintain sets of targeted and localized offers that best satisfy important business objectives. These goals include customer satisfaction, customer lifetime value, and category, channel, and corporate performance. By "offers," IDC Retail Insights means the broad set of attributes that characterize assortments, products, services, prices, utility, and convenience that match customers' buying criteria and shopping behaviors. Targeted and localized offers present a compelling "choice set" that satisfies and delights consumers. 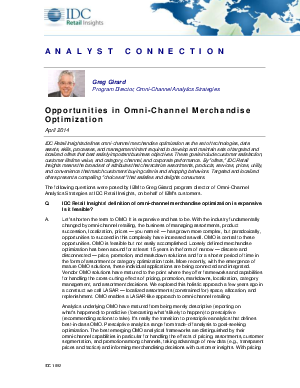 Download this white paper to read the questions posed by IBM to Greg Girard, program director of Omni-Channel Analytics Strategies at IDC Retail Insights, on behalf of IBM's customers.